Tokyo Yakult Swallows outfielder Wladimir Balentien blasted home run No. 56 on Sept. 15, breaking the single-season record in Japanese professional baseball that stood for nearly half a century. The 29-year-old former major leaguer crushed a pitch from Daiki Enokida of the Hanshin Tigers in the first inning at Meiji Jingu Stadium in Tokyo, prompting a rare celebration from Swallows fans, who have had little else to cheer this season. Balentien also went deep in the third inning for his 57th homer, further padding the new record, with 18 games still remaining in the season. Baseball legend Sadaharu Oh of the Yomiuri Giants set the home run mark of 55 in 1964, the year Tokyo hosted the Summer Olympics. Tuffy Rhodes of the now-defunct Osaka Kintetsu Buffaloes and Alex Cabrera of the Seibu Lions tied Oh’s record in 2001 and 2002, respectively. Controversy surrounded the attempts of Rhodes, an American, and Cabrera, from Venezuela, to break Oh's record. Critics said the players were not given any good pitches down the stretch. 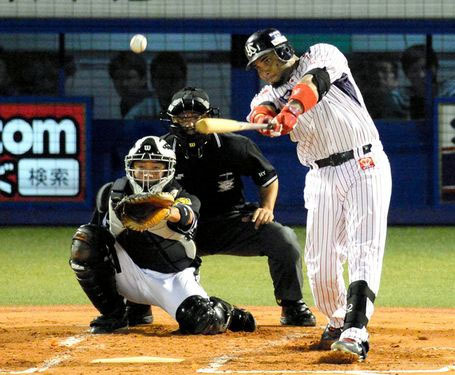 Balentien, who grew up on the Dutch Caribbean island of Curacao and is nicknamed "Coco" in Japan, hit his 55th homer of the season against the Hiroshima Toyo Carp on Sept. 11. But he failed to break the record in the following three games. Balentien played for the Seattle Mariners and Cincinnati Reds over three years from 2007, producing a batting average of .221 with 52 home runs and 52 RBIs. After playing in the Triple-A minor leagues in 2010, he joined the Swallows in 2011. In both 2011 and 2012, he led the Central League with 31 homers. Balentien took part in the World Baseball Classic tournament in March this year as a member of the Dutch national team. His bat helped the team advance to the final four.